It's official guys, summer is upon us! Every Brit has cracked out the factor 50 and a pair of shorts and they are ready for the sunshine (albeit temporary). One thing I love about the summer is that there is live music everywhere you turn. Whether you're going to the pub after work and there's an awesome little band entertaining the crowds, or you're packing your bags to go and sleep in a field for a few days at a festival, music can be found pretty much anywhere! I've always been a big lover of live music and festivals, and have often spent my summers wearing a floral crown and some wellies whilst I run around getting from stage to stage to see my favourite acts. There is something so exciting about being in a place surrounded by people who are all there to enjoy the music and generally have a good time! It's like all the adults have escaped from work for the weekend and have been let loose with ciders and glitter, and I bloody love it. Now let's get one thing straight, festivals are awesome because of a few key things. Live music, atmosphere, food and drink, and finally my favourite thing...fashion. At a festival you're allowed to let go and experiment, go wild with patterns, colours, and fabrics, or if it's sunny...hardly wear anything at all! Most girls tend to go for the boho look which consists of something loose, flowing curled hair, and floral patterns. Some girls of for a bit more of a grungy look with darker colours, shirts and boots - but whatever style you go for, own it! Although i'm not going to many festivals this summer, I love checking out all the celebrity style, and seeing how my friends and bloggers rock their summer style. 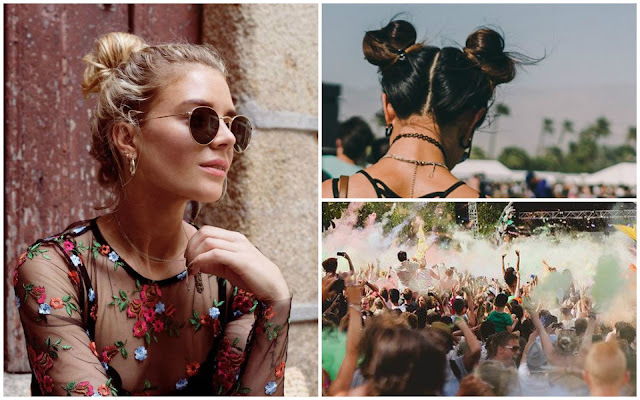 A few key looks that I think will be seen all over the place this summer will be floral mesh tops, check shirts and space buns covered in glitter. Some of these images here are a few of my favourite looks, what do you think? How would you dress for a festival this summer? If you want to get in the festival mood, watch the Glastonbury videos on Radio 1!